This week, if plans are realized, 100,000 people from a variety of walks of life will participate in trainings on nonviolent direct action in a program called “ the 99% Spring.” Featuring more than 900 training sessions slated to be held in 49 states, the 99% Spring—a movement for a nationwide push around issues of economic and political democracy—may be one of the most rapid mass mobilizations ever launched. According to Poo, the conveners started talking to their partner organizations, a diverse network of organizations by issue and constituency, to explore how to seize upon the moment that the Occupy movement has created. Soon after the initial organizations convened, others joined in, including Rebuild the Dream, the Other 98%, 350.org, the Service Employees Industrial Union (SEIU), the Communications Workers of America (CWA), and the AFL-CIO. To create a nationwide training and mobilization effort, “all kinds of organizations put forward their best staff, their capacities and resources to make it happen,” Poo says. 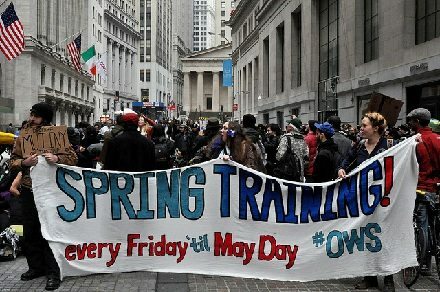 “A lot of members of the organizations put their whole life on hold.” Two staff people—Liz Butler from the Movement Strategy Center and Joy Cushman from the New Organizing Institute—have worked full-time on the 99% Spring plan. But the 99% Spring is meant for a more diverse constituency. Poo projects this outcome for the project: “By April 15th, we will have a found a way for [100,000 workshop participants] to connect their own stories to a common economic narrative that allows us to build a movement together.” That means reaching across racial and economic divides to show the connections between, say, the challenges domestic workers face in getting basic worker protections and the struggles of families that have lost their homes due to foreclosures. The training workshops become a way for the diverse membership of the 99 percent to see their interconnections, whether their interests are the concerns of organized labor, the environment, or justice for Trayvon Martin. In this way, the trainers are as much facilitators who will be drawing out the lessons and experiences of participants as they are imparters of a curriculum of knowledge of nonviolent direct action strategies and tactics. Lessons will be drawn from a multiplicity of movements, not just the civil rights movement (Martin Luther King, Jr. serves as an icon for the 99% Spring curriculum), but also from the farmworkers’ movement, movements around HIV and AIDS, peace movements, and the women’s movement, Poo explains. Although there will be skills-building around the tools that participants can use to take action on their own, Poo says that the trainings will allow participants to “leave with an idea of the kinds of campaigns out there with the issues you care about and how to plug in.” With over 200 organizations participating in and endorsing the 99% Spring—and supplying some of the more than 2,000 trainers—the 99% Spring is building connections not just among people, but among organizations with enough compatible political takes on the economic and political structures of the moment that they can recommend and link people to each other. Participants won’t have to leave flummoxed, asking, “What do I do next?” Instead, they will have gotten a sense of the “movement” organizations that exist and that share their concerns. Some criticism in the left wing press has emerged suggesting that the 99% Spring has been co-opted by elements of the Democratic Party apparatus, citing the central role of MoveOn.org, which some think has morphed into a Democratic Party mechanism, and Rebuild the Dream, which has been characterized as unlikely to take the Obama administration to task when it veers away from progressive Democratic values and priorities. But Poo asserts that the movement is not “affiliated with any political party,” arguing that the training is about “building a movement for economic justice,” not electoral politics. “We think the trainings will speak for themselves and the actions will speak for themselves,” Poo contends. Critics might see these events as a Democratic Party mobilization due to the MoveOn.org role, but others might find it distinctive for the program sponsors to be doing non-electoral movement organizing during a time when the White House is probably all but consumed with electoral mobilization. So what happens when 100,000 people pass through these 900 training programs, armed with a knowledge and history of nonviolent direct action? Poo says that there are some 100 actions planned at corporate shareholder meetings during the spring “to send a strong message about [corporations] paying their fair share.” Among the targets of these “shareholder actions” and “corporate accountability actions” are banks such as the Bank of America and Wells Fargo, due to their having “put millions of Americans into foreclosure.” A February press release from an “unlikely coalition of workers, retirees, families fighting foreclosure, students, immigrants, and environmentalists” identifies BofA and Wells, along with Sallie Mae, Wal-Mart, and Verizon, as “‘worst of the worst’ corporate offenders” that will be subject to actions such as “takeovers of bank buildings and meetings of corporate officials, civil disobedience, prayer vigils, and more.” The Nation’s Peter Rothberg adds Chevron and Exxon Mobil to the list of corporations to be touched by the “Shareholders’ Spring” actions. No one organization is in charge of this effort, according to Poo, though the Movement Strategy Center is serving as fiscal sponsor for the purpose of receiving donations. Much of the cost of this massive nationwide effort has been paid for in cash and in-kind donations from the participating organizations. There are also some grants from relatively small funders; Poo cited the General Service Foundation as one of the 99% Spring’s foundation backers. Grassroots democracy is very exciting. It is also unpredictable. Those 99% Spring activists who are willing to let the voices of the participants shape the agenda that emerges will be comfortable with the outcomes, as diverse as they might be. Those who might harbor aspirations of directing and channeling the energies of the 99% Spring trainees into established political venues might find themselves deeply disappointed.